In 2017 the film ‘Snooker Loopy’ Directed by Peter Flanek and Peter Mészáros of Hungary took home the title of our unearthed® food in film category supported by delicious. The stop motion video was made to promote a gastronomic section for a design market in Hungary. We’ve caught up with them to find out more. Tell us a bit about yourselves, what are your backgrounds? We both studied Graphic Design in the same class at the Hungarian Academy of Craft and Design in Budapest. After graduating we freelanced for some years, and later we both worked at international advertising agencies as art directors. Right now, we are freelancing again as art directors on a wide variety of projects. On film assignments we almost always work together. At the moment, we are working on a stop motion music video clip for a Hungarian band. As art directors we were involved in the making of many advertising spots. We were lucky enough to try out very different styles and approaches, among them some stop motion based films as well. We just fell in love with the charm of the technique, started to experiment more with it on personal projects, and slowly the animations we made got more attention, and brought some nice jobs as well. How did the film ‘Snooker loopy’ come about? Before the snooker video, we had made already another animation for the same client (the design market), which became very popular, so the organisers asked us to make a second film. Luckily it reached even more people than the previous one. Well, snooker! Actually, in the brief there was a problem to solve: as it is an ad for a food market we had to show the variety of goods - without highlighting any of them. We decided to show the products in short sequences, one after another, but then the ones which played already had to vanish quickly somehow. This is how the snooker table idea came into the picture, and with this we could solve that problem in a funny and easy way. All together it took maybe 3 weeks to make. The longest part was of course the preparation. The shooting itself was only one, but hard and long day, and then of course the editing and post production was done at the end. It was a very smooth process. As the first film was very successful we got a lot of freedom from the client, so we could work with no pressure. But I must say, to teach the spaghetti noodles to crawl into the bowl was not easy! What gadget can you not do without when you’re filming? Your top 3 tips for making a foodie film? 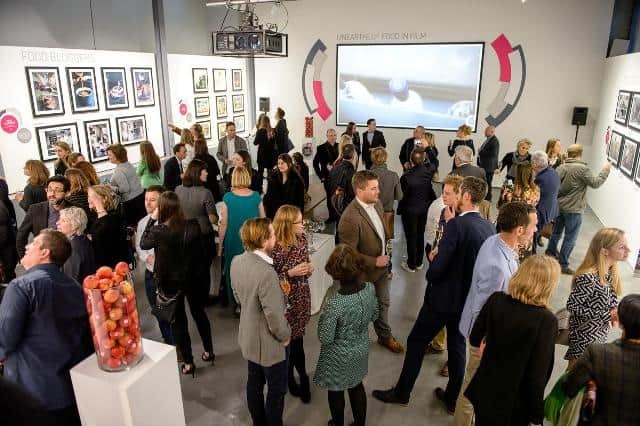 Now titled unearthed® Food Film Shorts supported by Foodism we will be showcasing more amazing food film shorts in the Threadneedle Space at the Mall Galleries, London in April. Click here to find out more.